Eckford Street Art Studio provides art for our Pre-K and K classes. 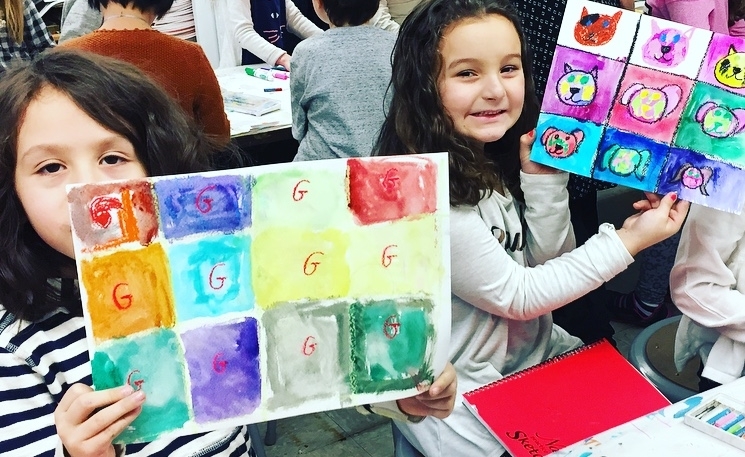 These programs pair a Teaching Artist with classroom teachers to create long term art projects in support of school curriculum. WMAAC's Arts-in-Education programs work together with PS 34 to bring the arts directly in to the classroom enriching and expanding students creativity, critical thinking and self-confidence through dance education. Their quality AIE curriculums build self-confidence, creative physicality, discipline and an opportunity for social and emotional growth through individual and group exploration. WMAAC programming allows the students to gain knowledge of the importance of a healthy, active body and engages their experiences through movement, concepts and writing. The P.S. 34 LEGO Engineering program uses LEGO Duplo, Simple Machines, and EV3 Robotics educational sets to give students an introduction to collaborative problem-solving through building and coding. The P.S. 34 LEGO Engineering curriculum seeks to harness children’s natural desire to play, build, and take things apart. These enrichment classes bring together the needed 21st century skills, cooperative skills, and incorporate the character education at the core of the school in a fun and highly motivating way. In class students learn the foundations of engineering: taking on a building challenge, planning the model, testing the model, and further refining the model all while working with others. Students at each age level will tackle increasingly complex engineering challenges. All students will learn about building for stability. The kindergarten through third grades will learn about stable simple machines. The fourth through fifth graders will use their knowledge about basic engineering and combine this with coding in LEGO Robotics projects. The Sketchbook Project is an independent Brooklyn-based company that organizes global, collaborative art projects. Our flagship endeavor is The Sketchbook Project, a crowd-sourced library that features 41,092 artists' books contributed by creative people from 135+ countries. The Sketchbook Project began in 2006 in Atlanta, GA and moved to New York City in 2009. Since that time, our small organization has grown into a worldwide community of more than 70,000 artists. By focusing on the intersection of hands-on art making and new technology, The Sketchbook Project nurtures community-supported art projects that harness the power of the virtual world to share inspiration in the real world. Kristi Goslar is a music Educator and Founder of Key of Be LLC. She provides general music education classes for grades Pre-K through 3, providing students with opportunities to develop a thorough knowledge and understanding of music through consistent interaction with the basic components of music education. This program adheres to Common Core standards. She provides percussion training for grades 4-5, deepening student's knowledge and understanding of musical concepts through hands-on Bucket Drum Training. She also teaches the chorus Program for grades 3-5. Students receive weekly vocal training in preparation for multiple performances, including participation in an annual all-city vocal performance through American Young Voices. Located in the heart of Historic Park Slope, the Brooklyn Conservatory of Music has become a hub of music instruction, performance and music therapy for Brooklyn and all of New York City. The Brooklyn Conservatory has partnered with PS 34 for 14 years, providing a broad scope of musical experiences and education for students, including early childhood music and movement, recorder, guitar and violin. This year, BKCM is delighted to offer instruction on band instruments and ukulele to 3rd, 4th and 5th graders. Kevin Ray is a Theater Director and Teaching Artist with over 16 years of experience facilitating theater workshops with young people in New York City. In addition to PS 34, Kevin teaches with Lincoln Center Theater, New Victory Theater, Brooklyn College as well as other programs. At PS 34, Kevin works with teachers and students to bring children’s literature to life through live performances. Each class selects a book and works together as an ensemble of actors to perform a short theatrical adaptation of their chosen book. Through the program, students use their imagination to bring characters to life, deepen their understanding of how to use space on the stage, and gain experience speaking in front of an audience.